Why do insurance companies use non-medical switching? In the modern healthcare environment, insurance companies regularly review and change coverage tiers and policies regarding specialty medications, or ‘biologic’ drug coverage. When prescription drug coverage changes are made, insurance companies notify patients that they may need to switch medications to one less expensive(based on how they’ve evaluated and reorganized their drug coverage policies) to avoid an increase in out-of-pocket costs. This is known as “non-medical switching”. Can non-medical switching harm patients? 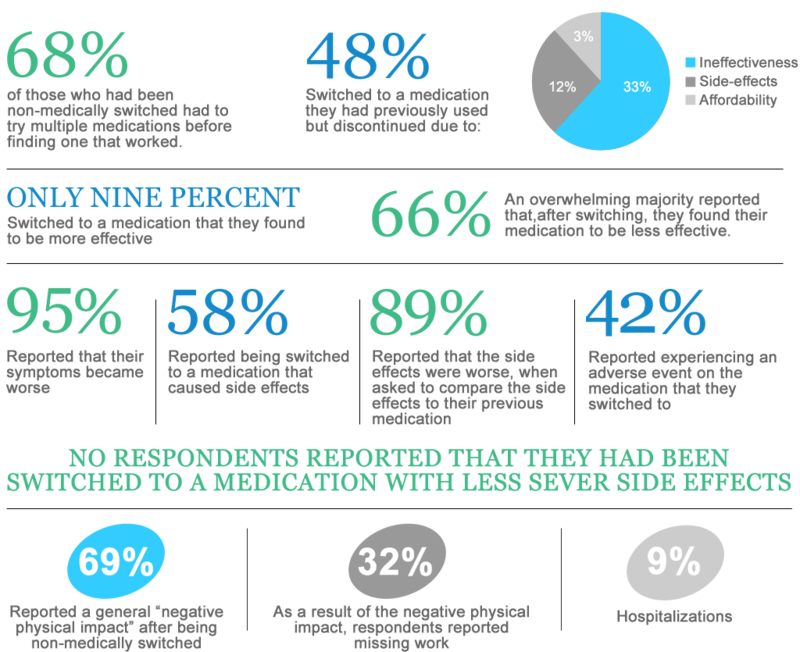 Yes, unnecessary medication switches can erode patient health & increase costs. When dealing with patients who have complex, chronic, or rare conditions, changing a stable patient’s medication put the patient’s health at risk, potentially causing adverse side effects and decreased effectiveness of their medication. One recent study of Crohn’s Disease patients found that switching from one therapy to another was associated with loss of effectiveness within one year. For a patient on a biologic medication, a switch can result in immunogenicity, which is an immune response that can lead to a severe allergic reaction and potentially cause patients to no longer respond to therapy. These unintended health consequences translate to increased ER visits, hospitalizations, physician visits and lab tests – which also drive up health care costs. 1 CONSISTENT COVERAGE: If the commercial health plan of a patient with complex, chronic or rare medical condition has previously approved a specific medication that is effective in stabilizing the patient, they will be able to continue use of the medication while under the health plan’s coverage. 2 FAIR OUT-OF-POCKET COST POLICIES: For these patients, out of pocket costs set by the health plan or PBM during open enrollment will not increase during the respective health plan year. 3 STABLE FORMULARIES: Patients who are stable on certain medications will not have those medications moved to a costlier insurance tier during the respective health plan year. This profile will be able to show you a current outlook for States that are currently considering or have recently passed legislation regarding Step Therapy. If you live in one of the highlighted states, get in touch with your local representatives and explain to them why these bills need their support. If you live in a state that is not highlighted, you must explain to your local representatives why they should draft this type of legislation and the positive impact it would have on people like you. We at GHLF are happy to help you prepare those comments if you need assistance.